The last house Paul and I rented had a bold red kitchen and serene sage colored living room walls, it rocked our world! Being a military family, we move so much and rent so often that painting walls is totally out of the question. Within a month of moving out of our colorful Florida abode and into our temporary rental home in NC, we were craving color. 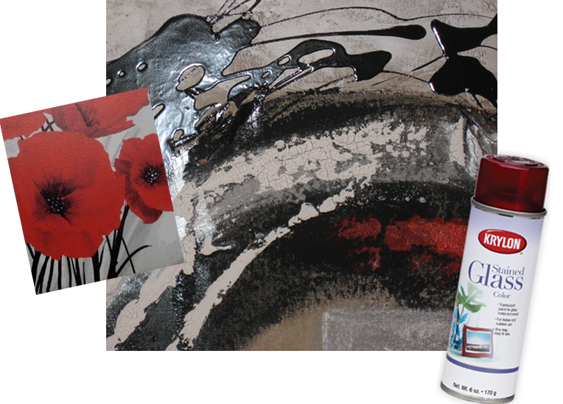 I fell in love with two canvas paintings that combined neutrals with a pop of vibrant red. Hellooo Red! Welcome back into my life! I have a TON of glassware around the house, my collection of boring clear glass everything doubled after the wedding and rehearsal dinner decorations weaseled their way into my closet. Let’s just call it like it is, extreme packrat-itis. And I’ve got it BAD! Luckily the super sweet folks at Krylon let me choose a few samples of paint to snazz up all this glass with. I jumped at the chance to test out their Stained Glass spray paint. 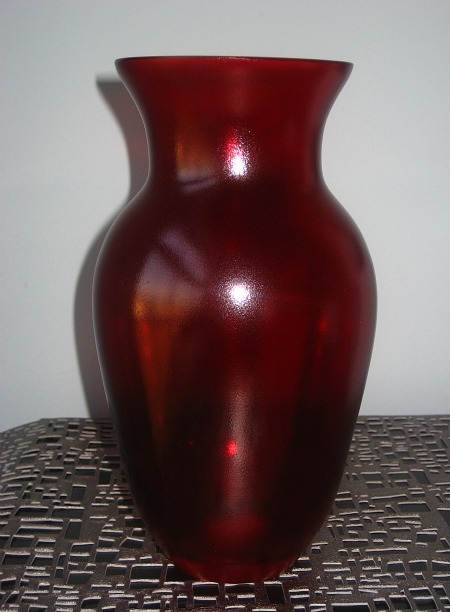 I’m hoping to combine gorgeous translucent stained glass vases with super bold lacquered vases to create an edgy arrangement on our accent table. First I started with a vase from one of my rehearsal dinner centerpieces. 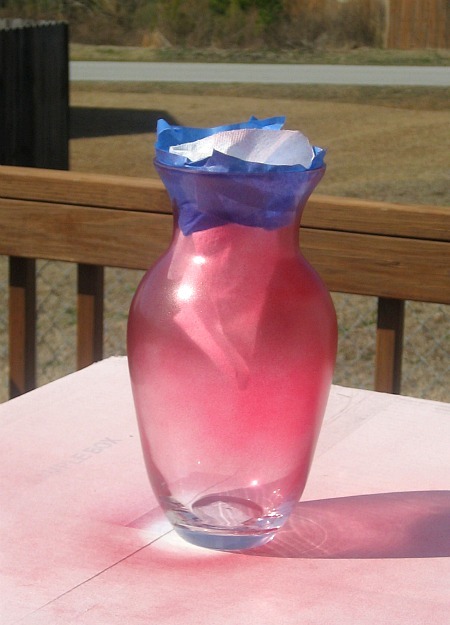 After washing and drying the vase thoroughly, I taped off the inside with blue painter’s tape and rolled up a paper towel to block paint from getting on the inside of the vase. Below is what the red stained glass spray paint looks like after one light coat. Super translucent and almost frosted! Gorgeous, right? It gets better! Lightly layering coat after coat of the paint produces a vibrant red that looks straight off the shelf of a department store. I’m obsessed! I sealed it off with protective coat of Krylon’s clear spray paint and called it a day. I can’t wait to make a few “friends” to hang out with my new stained glass vase! Have you used stained glass paint before? 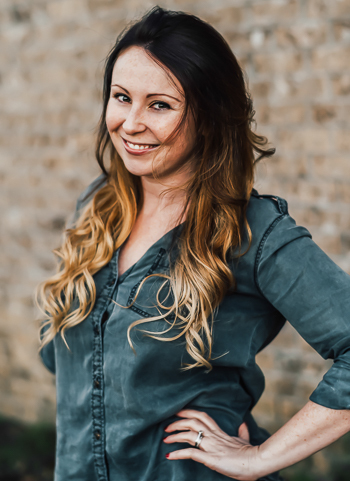 Another great tutorial with fabulous styling….love it! Thank you so much for sharing! I love that you offered these pics of the red stained glass as I am in search of them. I see NOW that from your pics… that it will work perfectly for my HUGE project. However, I need red, orange, yellow, green, blue & purple — desparately… anyone know where I can get ALL these colors? and kind’a quick? This came out so nice! I didn’t even know you could spray paint glass. Love, love, love it!!! I have a ton of vases left from my wedding, so maybe I’ll have to try this out! Can’t wait to see what your whole accent table set up will look like! I’ve never used stained glass pain before. I have a feeling I would make a huge mess. I love the red though, it’s very eye catching. You can do so many cool things with glass and spray paint; I like to troll my neighbor’s recycling bins (my husband pretends not to know me) for cool FREE glass bottles and then spray paint them. Love the vase! I will definitely have to get some of this paint! That is amazing! I need to take notes from all of your fun DIY projects! My apt needs some sprucing up! Okay…so I must copy this. I did not know such a paint existed! Much fun! so pretty. it turned out great! I would never have thought that you could paint glass. Oh wow! That is beautiful! Congratulations, the vase looks great. 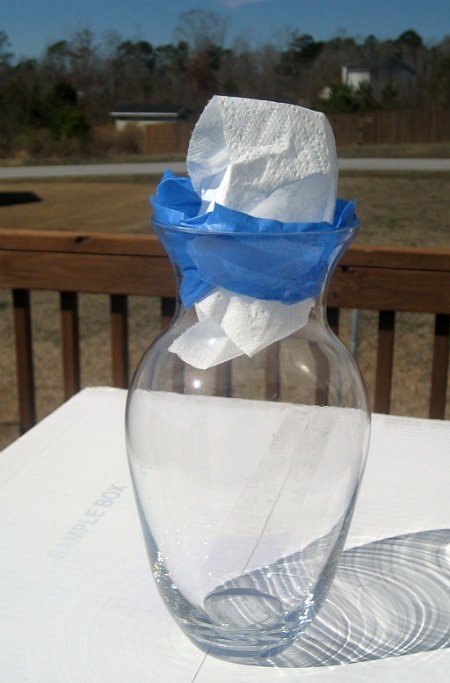 It gives me an idea….I saw a vase similar to this one at IKEA for a pretty penny….this is a better option. Thank you for sharing. OMG! So pretty!!! I love red! My diing room is a red color. Love this! That is gorgeous, I have never used it but I would try it now! I have been looking for the blue mason jars to use in my daughter’s wedding this summer and I just hate to pay $10 a piece for them. So I got the idea to just paint some clear ones and I found your pictures and man that is just what I been looking for. I’m going to the store tomorrow to look for this stained glass paint sure hope they have the color I need. Wow! The vase looks fantastic. I never knew clear spray paint existed. This opens up a world of possibilities with random dollar store glass items. I’m off to find some. Thanks for sharing. Very cool craft project! You have a great blog! I look forward to reading more projects. Super great! I love the spray, I will have to use it on a vase now! Great idea! Oh wow. I am definitely bookmarking this and planning to pick up some stained glass spray paint. It is so striking. Thanks for sharing. wow, i know now what to do with those liquor bottles i’ve collected. glad i haven’t thrown them. thanks for sharing this lovely post. red was perfect! I have a bunch of those florest vases. (My husband likes to buy me flowers, tragic I know.) How many coats of spray paint did you use to get that deep color? That vase looks awesome! What a face lift! And I’m sure it definitely brightens up the room! Sooooo beautiful! I absolutely love the red. You have inspired me, Jennifer! Great job! Gorgeous! I love red as an accent color! I used it in both my kitchen and my office! Wow!! That looks seriously amazing!! Love it, love it! WOW !!! i am soo loving it … it’s beautiful .. I love that canvas-and that vaas would go perfectly in our bedroom…i’m just going to come over and steal all these crazy crafts you come up with! And I might also camp out and eat some pizza with you in the am! girl! you’ve done it again..THAT LOOKS GREAT. I’m planning to paint bottles this weekend – loving your inspiration! This is so pretty!! You always amaze me!! I would so buy this! Oh my gosh. Can I just buy that from you?! ha. fab. I’ve never heard of stained glass spray paint. It really works well! I’ve got bunches of vases in my basement that could be made over using this stuff. Love the red that you chose! This is gorgeous! I could have so much fun with stained glass spray paint, I must find some now! That seriously looks exactly like the one I bought recently. Dang it girl. Will you please come and decorate my house? Wow that is really cool. I have never used or even heard of stain glass paint. This is a perfect summer project! It makes me sick how you are so good at this. Come to my house, and let’s have a decorating party. You can provide the food. Otherwise, we are eating cereal. Oh my gosh that came out so pretty! Seriously girl, you and your craftiness never cease to amaze me! I had been thinking that this summer I would look for blue glass bottles for my kitchen window. Now I can save time and choose the shape/size. Thanks for sharing! YOu are SO crafty! I love the vase! This is seriously awesome. Super creative and the best way to bring out some (CHEAP!) color to the room! I love this. I’m definitely going to be trying this one soon. I love crafty things like this! SOOOO pretty! I love how it turned out! You rock by the way! Wow this is beautiful . I have never done this but I am going to have to!!! Wow, that turned out so pretty! Love the color too! I’ve never heard of stained glass paint before. I’ll have to keep my eyes open for it. Your just so crafty lady. It turned out great. I love the color. wow this turned out gorgeous!! so pretty!! You really inspire me…I have about 10 vases that need color. Thank you. i love love love it! 🙂 brad and i are moving in together in april and i’ve already started thinking about packing and what i need to get rid of. i have a TON of fun shaped wine bottles sitting on a shelf in my kitchen. i was going to recycle them, but now i’m totally saving them for this project! oh my word. i can’t believe how well this works! we have tons of extra glassware as well – i think i need to hop on this crafty train of yours. thanks for this review and how to – I’m looking for it next time I’m at Michael’s! So beautiful!!! Hope to see more!!! This is awesome! I’ve never heard of stained glass spray paint, but LOVE the look of it! That is gorgeous! I never would have thought you made it instead of buying it. This is why it’s good to be a packrat! Thanks ladies! 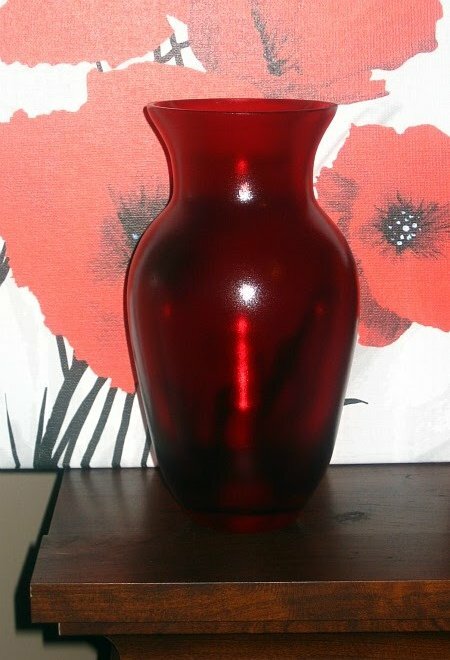 =) I love that it cost less than all the other vases out there — even the cheap target ones! ooooohhh pretty! i didn’t know they made stained glass spray paint!!! how exciting!!! I love this! I can’t wait to use all your fun ideas! I know all about the “temporary military” madness! Haha. what a great DIY! this looks amazing! ooooh- pretty! Where did you get the spray paint? I just discovered a Michael’s near me. I’m guessing I could find it there?